DoneJS doesn't just make it easy to build high performance, real-time web and mobile applications. It can also be used to create reusable plugins that can be shared across different applications. In this guide we will create a reusable number input widget using Bootstrap styles. We will create the project on GitHub, initialize the repository as a new DoneJS plugin and then set up continuous integration with Travis CI. After running development mode we will implement the component functionality and tests and submit it as a pull request to the repository. Finally we will make a build and publish the plugin to npm as well as look how to use the published module in other projects. We will use GitHub to host the code for the project which makes it easy for others to contribute and to automatically run the tests in continuous integration which we will enable later. If you don't have an account yet, go to GitHub to sign up and follow the help on how to set it up for the command-line git. 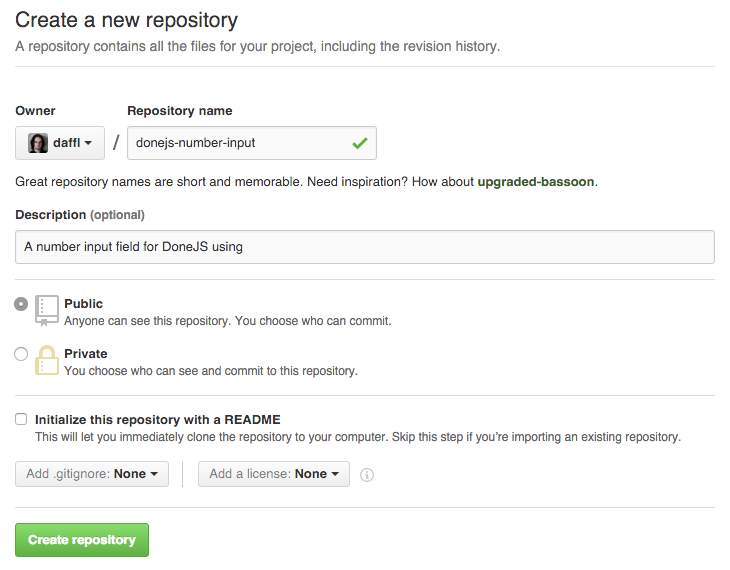 Once completed, you can create a new repository from your dashboard. Important: In the remainder of the article the plugin name will be <username>-number-input. You will have to replace <username> with your GitHub username to get a unique module name that can be published to npm. Now the generator will initialize the default plugin layout and install all its dependencies. This will open a Firefox browser, run two tests and output the result on the console. This command can also be used to automatically run the tests on a continuous integration server. There are many open source CI servers, the most popular being Jenkins, and many hosted solutions like Travis CI. If you now go https://travis-ci.org/<your-username>/<username>-number-input/builds you will see the build running and eventually turn green (which will update the badge that got added in the readme.md file). The server will run at http://localhost:8080. You can view the main test page at localhost:8080/src/test/test.html. Any changes to the test file or module will re-run the tests right away thanks to hot-module-swapping. This creates a complete component using the <username>-number-input tag with tests and documentation. Because the module name is the same as the plugin name (<username>-number-input), the generator will put the component files directly in the src/ folder (instead of a subfolder). Confirm the default tag name by pressing enter. Confirm the prompts to overwrite the existing files by typing Y and pressing enter. The initialized component can now be viewed at http://localhost:8080/src/<username>-number-input.html. The component tests are available at localhost:8080/src/test.html. This template first imports the Bootstrap LESS. Then we create a button group with a - button on the left, a number input in the middle and a + button on the right. When the buttons are clicked the increment or decrement view-model methods are being called. The value of the input field is two-way bound with the value property of the view-model. When the value is either min or max, the - or + buttons will be disabled. $ git commit -m "Implementing number-input component functionality, template and tests"
Now that we implemented the number input functionality and have all tests passing we can make a build of our plugin that is usable standalone in the Browser, with an AMD module loader like RequireJS or as a CommonJS module which works e.g. with Browserify. Will create a dist/ folder with the global, amd and commonjs version of our plugin. Now version 0.1.0 of our plugin is available on npm. For your own published plugin you would use <username>-number-import of course. Once you published your plugin, let the world know about it. Tweet @donejs and post it in the Bitovi forums and on Slack (in the #donejs channel). Those are also great places to get quick help with any questions.